How to seach for a specific person? In the pipeline you are able to see the process flow of the attendee in your event. You are able to control and see if the attendee has completed the registration form, purchased any tickets for the event, etc. 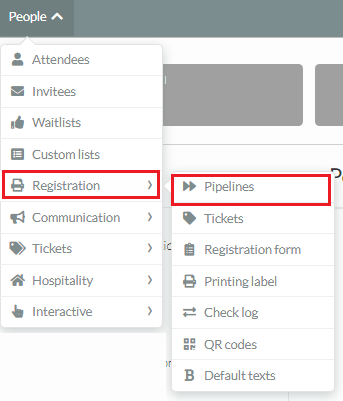 Click on: People > Registration > Pipeline. People List - Everyone that will be attending the event. Invite List - Everyone that has been invited to the event. RSVP List: Everyone that has not answered to the RSVP. Purchase Unfinished : A list that states people who haven't completed a purchase (if required). Pending Approval : A list of all people that have pending transactions. Approved: People who have completed these steps, and are confirmed to the event. Click on 'Search' (upper right side of the screen). Then, add the name, and it will automatically identify the name requested.